A common commercial challenge for organisations operating in sectors such as education,government and non-profit,is answering the need for high speed print production a talow,controllable cost. pecifically designed to produce high quality document output. The CopyPrinter will add flexibility to your document production with versatile paper handling to fulfil a variety of single sheet output requirements. More print jobs can be accepted,prodution easily monitored and documents sorted for easy distribution throughout your organisation. This model is easy to use,reliable and maintains its productive performance.Compelling speed and quality make Gestetner CopyPrinter the ideal choice for flexible and cost effectivehigh volume document production within your organisation. Meet tight deadlines with the productive CopyPrinter duplicator This model provides a quickdocument turnaround,with a fast speed of 130 prints per minute (ppm),allowing high quality documents such as newsletters,leaflets and forms to be produced quickly and efficiently. For more cost effective printing,A3 documents such as papes from textbooks or booklets can be scanned via the platen glass and re-sized to B4. Save time with class mode which produces printed material in class sized batches,ready for immediate distribution. Achieving a low cost per page is a crucial part of day-to-day document production. 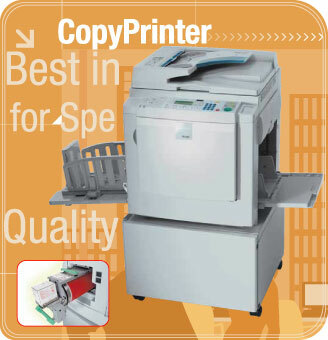 The CopyPrinter provides controllable running costs for sustained high volume output,so the more you print, the more you save. The user code feature will help you stay in control of your organisation s print output by monitoring the usage for easy cost allocausas per department. Further cost saving is available with economy mode,which allows you to get more output from each ink cartridge and is ideal for printing everyday internal documents such as forms and worksheets.